Discussion in 'Miscellaneous Universal' started by Brian G., Nov 5, 2018. Film rights for books are proportional to popularity. MOST rights will sell for around $50,000. The Harry Potter rights (the biggest book series of all time) was $2m for the first 4 books. That's $500,000 a book. So, six figures. If you're going to try and troll, know the topic. therock, Mike S and Mad Dog like this. I believe he only has two small parcels left - one is wetlands, and the other is a utility easement & possible ROW for extending Kirkman Rd the rest of the way to Destination Pkwy. Those parcels are almost useless to Universal and I see no reason why they would pay very much to acquire them. Except that wetlands can be "moved" to create developable land. Disney has done it for years now, that's why they just acquired all that new property in Kissimee. That utility easement divides the property, and once again CAN be relocated. It will cost a fortune to do it, but it's possible and would make the land more valuable because it will make the parcels all contiguous. Ah. I misread the sarcasm. You dedicate a couple hundred thousand words to writing, re-writing, and re-writing something again, you get defensive. truejonas, Mike S, JoeCamel and 1 other person like this. Lol @ people still discussing a 4th dry park when we don’t even have a third. Why not discuss Universal London? Or Disney India? I expect the 4th theme park to open about 10 years after the 3rd one. With the water park opening between them. The last two resorts will open after the 4th theme park. For a total of about 15 years. By “between them”, you don’t mean in the middle, right? 7-8 years after park 4 would be a terrible move. I’d wager it’d be open within a year of park 4 opening. LintemuthStudios and JungleSkip like this. Why not discuss Universal London? Quint, shiekra38, SeanPhilly and 3 others like this. My theory is with Fantastic Worlds taking shape the years of "what if..." now needs to be moved to ANOTHER park instead of just debating if it's worth an expansion in the already built parks. truejonas, shiekra38 and Alicia like this. What about a 6th park? hishedale, Quint, truejonas and 6 others like this. Quint, Joel, truejonas and 7 others like this. I have no problem to call the new Today Show Cafe a theme park on it's own. I mean the press is calling the Potter lands "theme parks" so we are almost there. But please no more silly discussions about anything after Fantastic Worlds. truejonas, natespf and LintemuthStudios like this. I mean, if you want to go the Themeparx right now, they have a lovely thread on that..
To bring the thread back to focus, I'm somewhat curious about the lands that they could get from Thomas that are still remaining. If anything, it could be a good place for offices and backstage aspects, further allowing the park's to flourish. So an interesting little tidbit was recently brought to our attention. 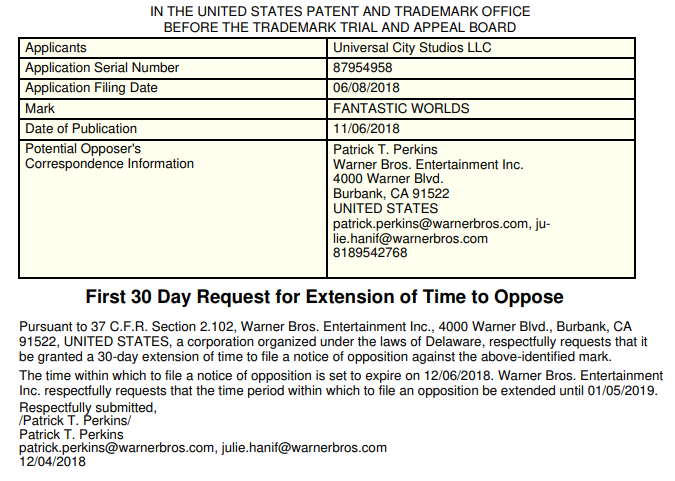 It seems that Warner Brothers might be trying to prevent Universal from registering the "Fantastic Worlds" mark. After a trademark is filed and its application is reviewed and approved by the USPTO, there's a 30 day period where the mark is published in the Official Gazette to notify the public of the intent to register the mark. During this period, any party can file for opposition for any number of reasons, but typically, the most common reason is if they believe the mark is too close to one of their own and may cause confusion. It should be noted that this case is being handled through the Trademark Trial and Appeal Board (TTAB), which is a a "kinder, gentler form of litigation. There are no court hearings in TTAB actions, as nearly all matters are handled in writing. The Board does not have authority to impose any monetary sanctions." So Warner Brothers isn't suing Universal or anything serious like that. They now have until March 6th to file their Notice of Opposition which will outline their case for why they believe "Fantastic Worlds" might infringe on their existing marks. 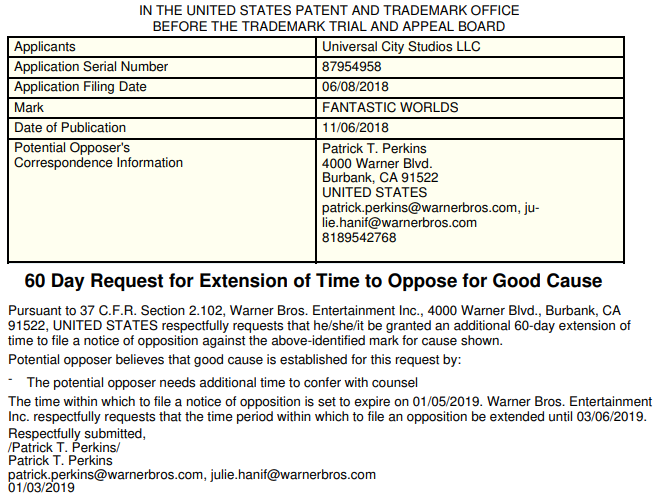 I think it's pretty obvious which mark(s) Warner Brothers thinks the name is too similar to, based on the initial knee-jerk reactions when the Fantastic Worlds mark was first filed. What's most interesting to me, however, is the fact that any of this is necessary at all. You'd think that if Uni and WB were in discussions about the inclusion of Fantastic Beasts attractions in their new third park that the name of that third park might have come up. I guess it's possible Universal is really that secretive even when working with their largest IP partner, but it just seems like somewhat of an obvious discussion to have considering how similar the name is. Anyway, we'll be sure to keep an eye on the TTAB side of things for any updates - but I figured this might spark some new, exciting discussion in the meantime! SeventyOne, dustinwashere, Andysol and 15 others like this. Just change it to Epic Worlds and be done with it. SeventyOne, Coolbfitz, shiekra38 and 4 others like this. It should be noted that this case being handled through the Trademark Trial and Appeal Board (TTAB), which is a a "kinder, gentler form of litigation. There are no court hearings in TTAB actions, as nearly all matters are handled in writing. The Board does not have authority to impose any monetary sanctions." So Warner Brothers isn't suing Universal or anything serious like that. They now have until March 6th to file their Notice of Opposition which will outline their case for why they believe "Fantastic Worlds" might infringe on their existing marks. Thanks for the write up! I agree that it seems to be a minor set back, if one at all. It is not uncommon for partner companies to have a disagreement, taking it to arbitration having a 3rd party to keep it fair. I've said it before Epic Worlds sounds much more inline with Universal than Fantastic Worlds. SeventyOne, truejonas and Coolbfitz like this. I like both, but prefer Epic. I'm becoming a fan of "Laversine." truejonas and JoeCamel like this. So which land is he selling off? Parcel #1 is more important given how close it is in the resort proper. 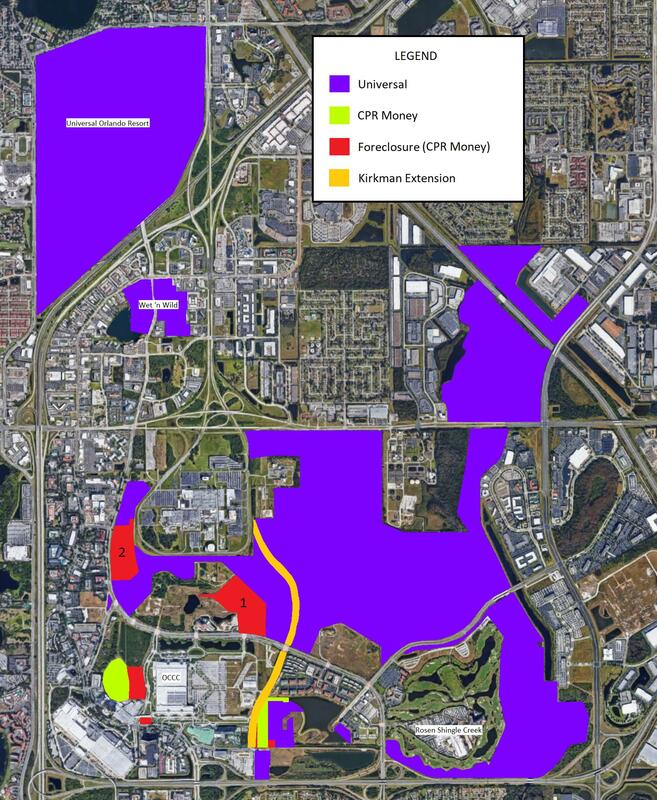 It could either become a water park along with the parcel just to the east, or it could become another resort. Universal would use parcel #2 as part of a 3000-4000 room hotel complex with the parcels above/below it similar to Endless Summer Resort. Andysol, Quint, CyborgDinosaur and 5 others like this. Those 2 parcels are the main ones that Universal wants. Shot in the dark..I think they'd aim for getting 2 as the immediate, and if possible; to get 1. 2 allows them a large space on the western side that could actually be used perhaps, as a proper transportation area eventually down in the line; and it would also ensure that they could have an easier time connecting the ESS complex with Site B.